I am enjoying my vacation out west immensely but I would be lying if I said it doesn’t feel weird not writing five times a week. With a hectic schedule the past several days, I have not posted at the typical rate that many of my readers expect. Hopefully you can forgive me. I did want to update you on a couple fun ventures I have embarked on over the last week. 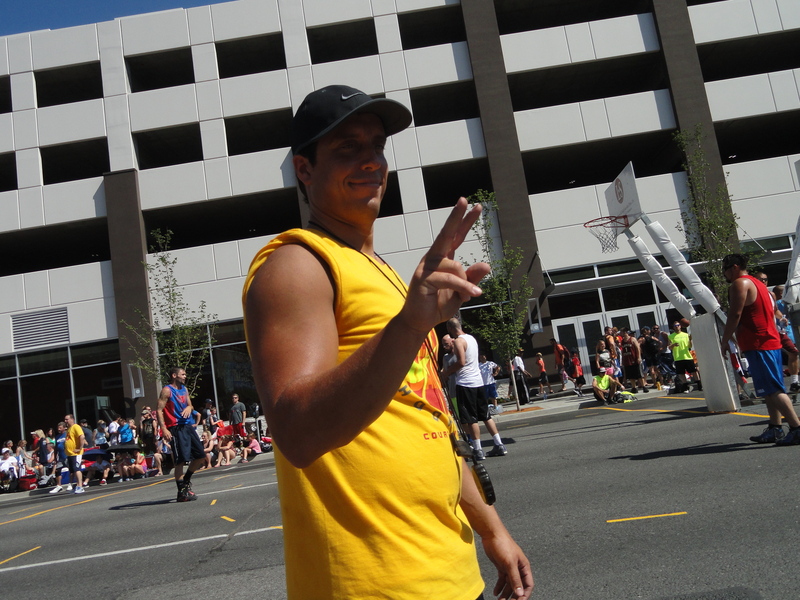 First of all, I completed my seventh year as a court monitor this past weekend for Spokane’s Hoopfest. While all the locals complained about the 100+ degree heat as they pretty much melted on the asphalt, I was doing my thing while saying “What’s the big deal?” The Southern humidity conditioned me well and I had no problem staying out in the extreme conditions for ten straight hours on Saturday and eight hours on Sunday. As for my court, I must say from top to bottom it was the most talented bracket I had ever officiated. With the high talent level came high competitive juices. Two fights broke out under my watch throughout the weekend. At the end of the game that contained the second fight, the instigator, who was a huge bald man with a goatee stood on top of the curb and yelled at me. With his already intimidating presence magnified by the few extra inches given to him by where he stood, it was a nerve-wracking experience. Luckily the Hoopfest rapid response team was right there to keep me safe. Me meeting with two of the teams in my bracket prior to the game. A couple personal memories from Hoopfest 2015 will be forever documented thanks to media coverage. KXLY, a local news station in Spokane, did a story about Sidney and I traveling so far to volunteer. To view Grace Ditzler’s report, click here. Also, a team in my bracket was composed completely of homeless gentlemen. KXLY was also on hand to tell that story. To view that report, click here. This past weekend was awesome and I owe a big thank you to Sidney, my mom, and my dad for all taking turns keeping score for me. Just doing my job during Hoopfest 2015. 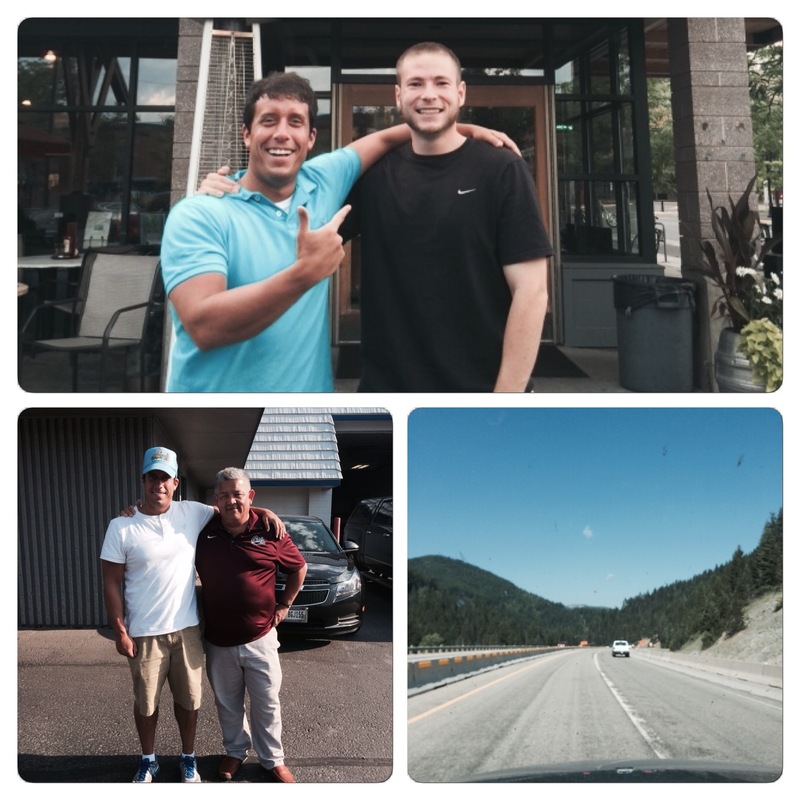 Yesterday, Sidney and I made the drive to Missoula, Montana. Driving over the two passes, it was Sidney’s first time ever seeing real mountains. Making the trip to Missoula was important to me because after 15 months since setting foot in the city, I wanted to go back to the place that gave me so much. We arrived in Missoula at around 10:30 a.m. and went right to the University of Montana campus. Sidney and I walked straight to the Adams Center so I could say hi to all my former colleagues in the athletic department. It was nice chatting with these people who I worked so closely with over the span of five years. It was especially humbling that Kent Haslam, Montana’s athletic director, took time out of his day to talk with me for about 15 minutes. After visiting with Grizzly Athletics, Sidney and I went outside and met Dan, one of my very best friends from my college years. We walked around the campus and then enjoyed lunch at the Press Box. From there we hit up the mall where we met another friend and then we ventured over to a bowling alley. Dan dominated Sidney and I over the course of three games in the outdated, empty building. Mad that he crushed us so bad, I dropped Dan off at his car and he made the trip back to Kalispell (thanks for making the day trip to see us, Dan). 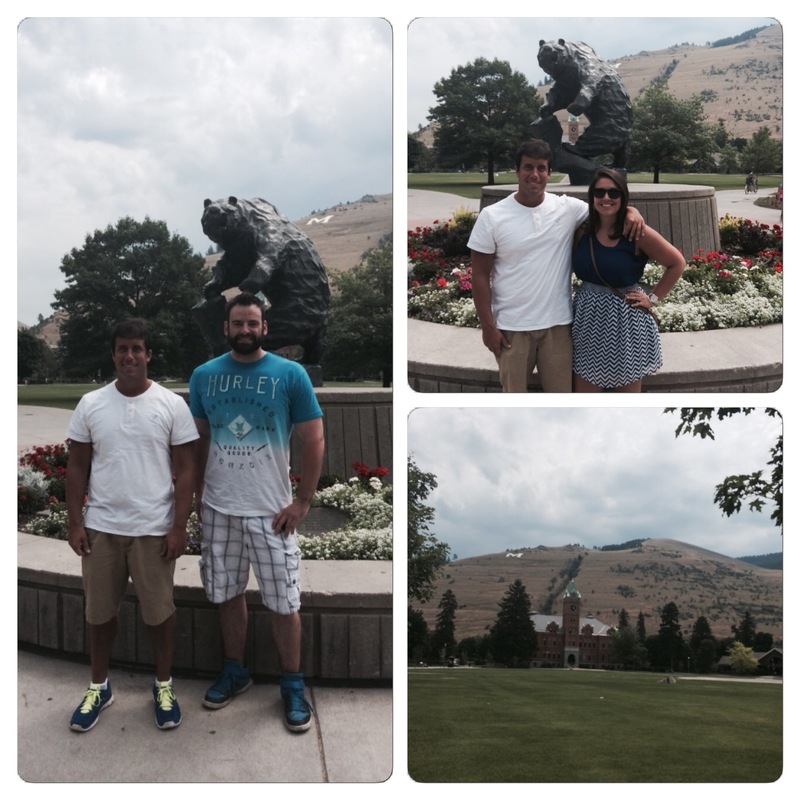 We enjoyed walking around the beautiful University of Montana campus. After checking in at our hotel, we met up for drinks with my great friend Pete at a new place in Missoula called the Thomas Meagher Bar. After some great conversation, Sid and I went to one of my favorite places in the city, the Iron Horse, to meet Shaun Rainey, his wife Britt, and their new son Brandon for dinner. We had a delightful time catching up and sharing a few laughs. From there I took Sidney around downtown Missoula where we made a few stops at some of the city’s famous watering holes. We returned to Spokane early this morning. Shaun and I in the photo on top, Pete and I in the photo in the bottom left corner, and a view of the scenery on the drive back. I am excited for the next couple days. While I enjoyed the hectic-nature of the past week, I am looking forward to just relaxing around the house for the next 48 hours. I plan to use every minute to enjoy myself and re-charge. Come Friday we will be traveling again on what will be a very busy few days. Hope the month of June was a great one for you. As always, it was awesome for me. 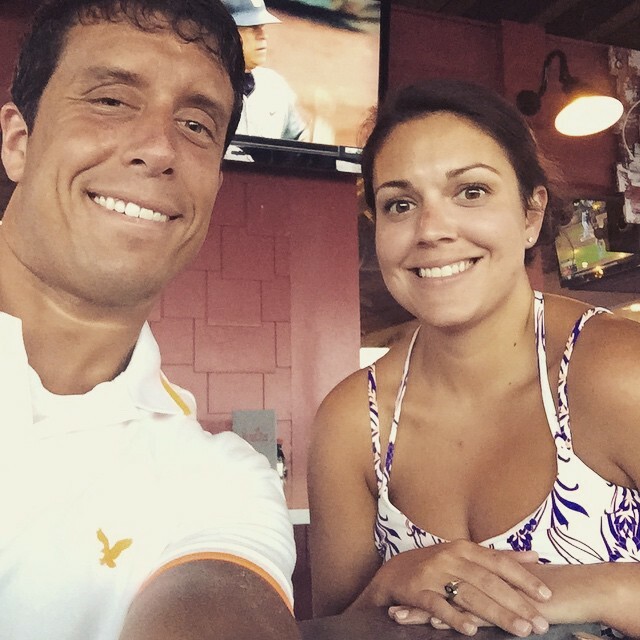 In a blog post at the start of the month, I mentioned how June of 2015 was going to be a special one for me…you would say my prediction was spot on, right? Don’t Blink. After a one-year hiatus, I am thrilled to participate in the world’s largest 3-on-3 basketball tournament once again. 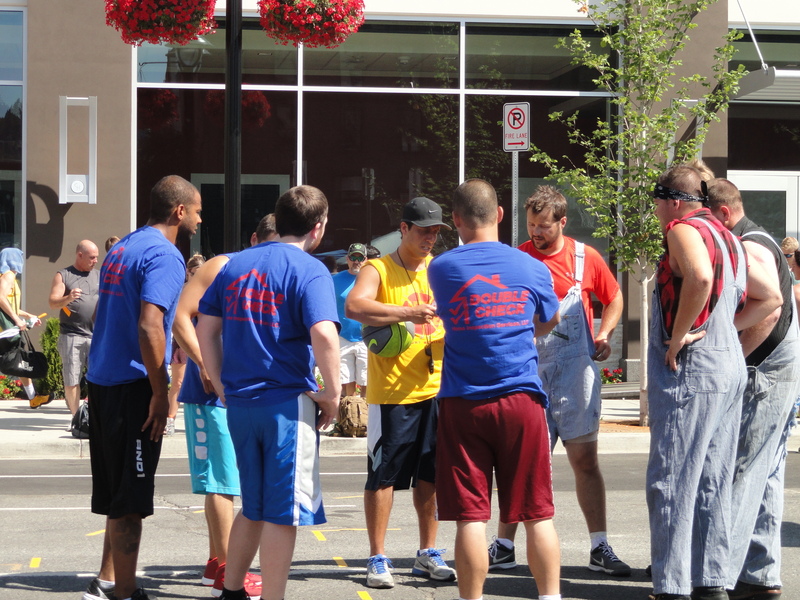 I am back to serve as a court monitor at Hoopfest, the signature event in the city of Spokane. This tournament is so big and so distinctive that ESPN is in town and Sportscenter will broadcast LIVE from Hoopfest for three hours tomorrow. This weekend will mark my seventh time volunteering as a court monitor. From 2008-2013 I labored on the streets of Spokane helping to keep order on various courts. Each year brought different challenges and different memories. I can’t wait to see what 2015 has in store. To be honest, this year has already been memorable. This morning when we went downtown to pick up my court monitor equipment and gear, Sidney and I were interviewed by Grace Ditzler of Spokane news station KXLY. 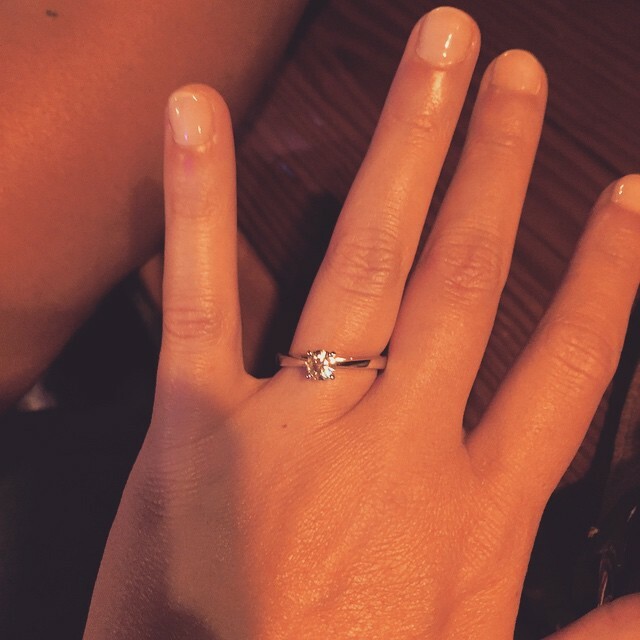 She told the tale of a “Hoopfest Love Story” in which Sidney and I traveled all the way to take part in this marquee event, making it our first major activity since our engagement. The report turned out awesome. Click here to watch it. Sidney and I on the news this evening. 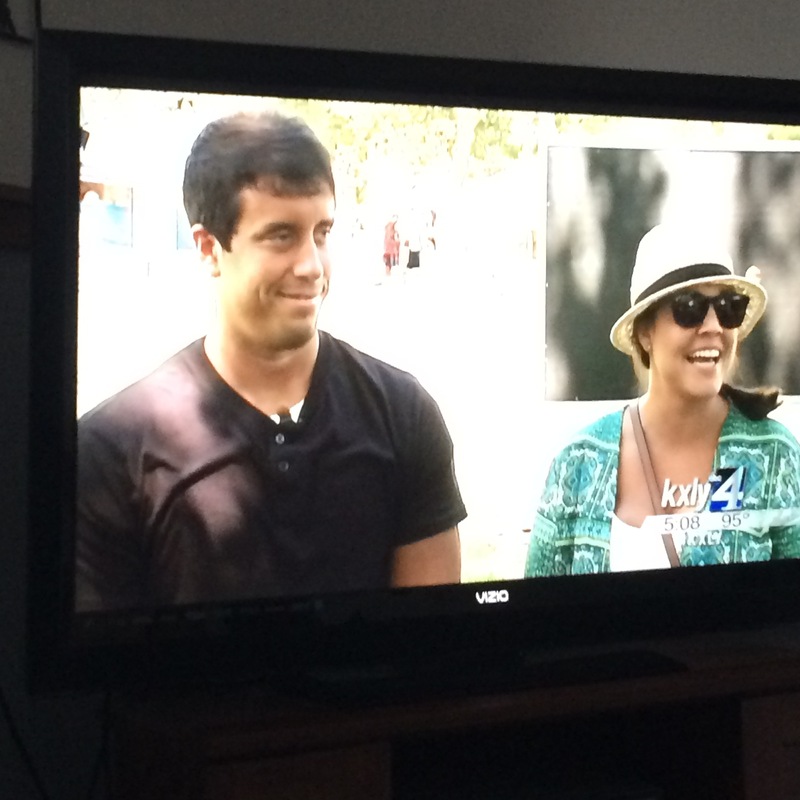 KXLY interviewed us this morning. The report turned out great. This year my assigned court monitor post is once again in the Main and Washington area of downtown Spokane. 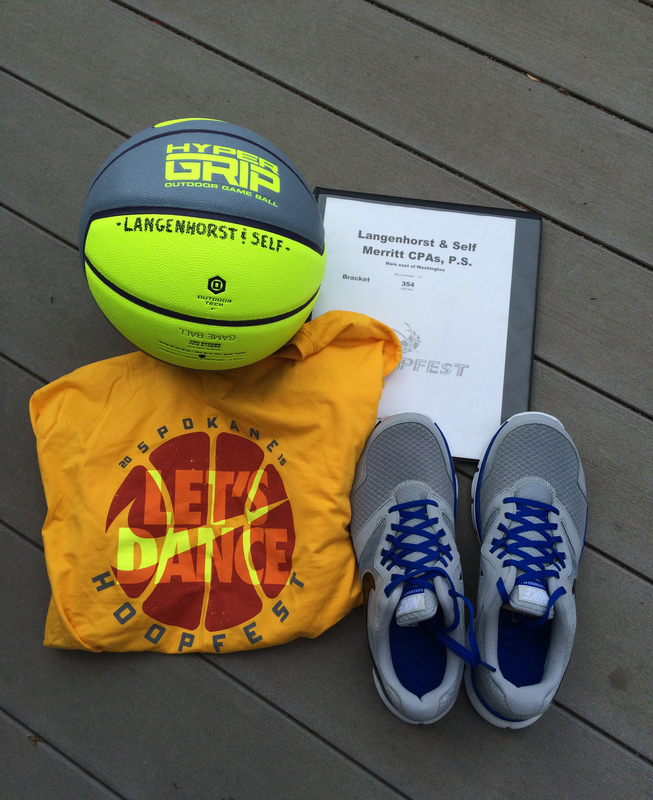 My court backboard is Langenhorst & Self CPA’s. I have an adult male court so you can be sure that the competition will be hot and contested. And believe me, I am not kidding about the “hot” part. The forecast calls for tomorrow to hit 104 degrees and Sunday to reach 106 degrees. The hydrating for me starts right now. 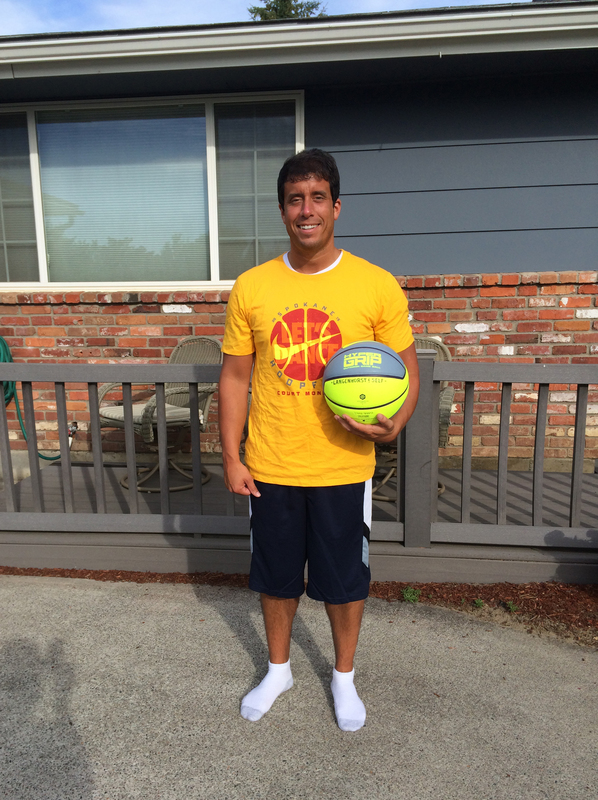 2015 Hoopfest court monitor t-shirt with my bracket book, the ball, and shoes. To anyone in town for Hoopfest, please don’t hesitate to stop by and say hi. I am so excited to be back in town for one of my favorite events and I can’t wait to share it with Sidney who will serve as my scorekeeper. Enjoy the weekend and I hope to see you on the streets of Spokane. Don’t Blink. It is the eve of another long trip out west for me. Don’t take that as a complaint by any means, I am stoked! Whenever you get to go home it is a joyous occasion. Tomorrow after work I will rush to my place, grab my bags, and head off to the airport to begin my trek to Spokane. This particular trip, just from the travel standpoint, will differ a little bit from my flights during the holidays. First off, I will have a travel partner! Sidney (more than just my travel partner) will be at my side the whole time. Although she visited Spokane for a short period during the Christmas holiday, this occasion she will be with me every step of the way starting when we take off from Myrtle Beach tomorrow to when we return on July 8. Additionally, we will tough it out through an interesting experience as we spend the night in the Seattle airport. Throughout my flying career I have never spent a whole evening at the airport but that is the price you pay when you fly weird times in the middle of the week. It will be very well worth it. We have a lot planned over the next two weeks. After a one year hiatus, I will once again volunteer at Hoopfest, the planet’s largest 3-on-3 basketball tournament in the world. Back for my seventh season as a court monitor, I am excited to once again be part of my hometown’s signature event. After Hoopfest weekend, we will venture outside of Spokane and make visits to Missoula, Seattle (outside of the airport), and Walla Walla. I can’t wait to show Sidney these western cities! Of course the best part of this impending trip is the opportunity to see my family. In addition to my parents, brother, and sister, I will be reunited with my niece who is now 9 months old. She has grown so much since I last saw her at Christmas. Snapchat videos can only do so much justice. I will also meet a new member of the family for the first time. My parents welcomed a kitten into their home about three months ago and I can’t wait to meet and play with her. There is one thing awaiting us out in Washington state that I didn’t anticipate a couple weeks ago, however. The area is expecting record heat throughout the next several days. Hoopfest weekend has forecasted temperatures for 100 degrees and 104 degrees. Sure the humidity won’t be as intense as I am used to down South but let’s not kid ourselves….100 degrees is 100 degrees. When we arrive on Spokane soil we will be fully expecting a scorcher. But it doesn’t matter, 0 degrees or 100 degrees, I am so excited for a vacation with my loved ones. For those of you who live in the places I mentioned, I hope that we can connect. Over the next couple weeks my posts to Don’t Blink might decrease a little bit. Never fear, I will be back at it after that first week in July. West coast here I come. Don’t Blink. You might be a little surprised by the website I spend the majority of my own time on. Believe it or not, it is not a social media channel nor is it ESPN.com. For all those academic brainiacs out there, you probably won’t like what I am about to praise as my favorite site to waste 45 minutes on. When it comes to satisfying my curiosity or checking something of importance, I turn to Wikipedia. Sorry if that made you vomit. I can’t lie to you though, I love Wikipedia. Six years removed from writing my last academic paper, you don’t have to worry about me using it as an official source or a God-given fact. Rather, I just use it to look up random information. I might use it to read up on a television show of my youth. I will pull it up to learn about a restaurant chain. I will refer to it for a quick summary on a historical event. I use it to read movie plots. If I am ever daydreaming and a question pops into my head, chances are I am searching Wikipedia. This afternoon I went to a local Subway by myself for lunch. I got my sandwich and sat down inside the restaurant. I took out my phone and perused Wikipedia the whole time. The funny and addicting thing about Wikipedia is you can start on one article and then jump around to a variety of other articles. For example, today at lunch I read about Pringles and that article led me to Chex Mix which led me to Chex Cereal which led me to Kix which led me to Trix which finally landed me at Bugs Bunny (apparently the Trix rabbit once appeared with Bugs Bunny). I pretty much went on a carousel of random snack and cereal trivia. Little did I know when I went to work today I would come home with the knowledge that the Trix pieces became brighter in 1991 and then again in 1995. Talk about an educational lunch! Wikipedia is great because it is easy reading. The information is laid out in bold sections and the literature is written in a clear and basic way. My main struggle is to finish an article rather than click on a blue highlighted word that will take me to another article. This weekend I was reading about Major League ballparks and I was on Kauffman Stadium. I was going right along when I saw the the word “AstroTurf” highlighted in blue. I just had to click on it. I know a couple people who consume YouTube like I do Wikipedia. They jump from one video to the next, never thinking about stopping, satisfying themselves with mindless internet entertainment. I get their addiction and they get mine. The only difference is that I don’t do videos, I just do the text. My goal is to one day have a Wikipedia page about me! Of course it would contain my blog address, my different degrees of weirdness, and a “controversies” section. Until that happens, I will just continue to read about snack foods and ballparks. Don’t Blink. Today we celebrate Father’s Day. Most of us do all we can to recognize and honor our dads as we make this day as much about our patriarchs as possible. Excuse my selfishness, but today I am feeling pretty good myself. This isn’t a year where I tell my dad Happy Father’s Day and then wish that I was there with him, knowing that I still have to wait until the holidays to see him again. 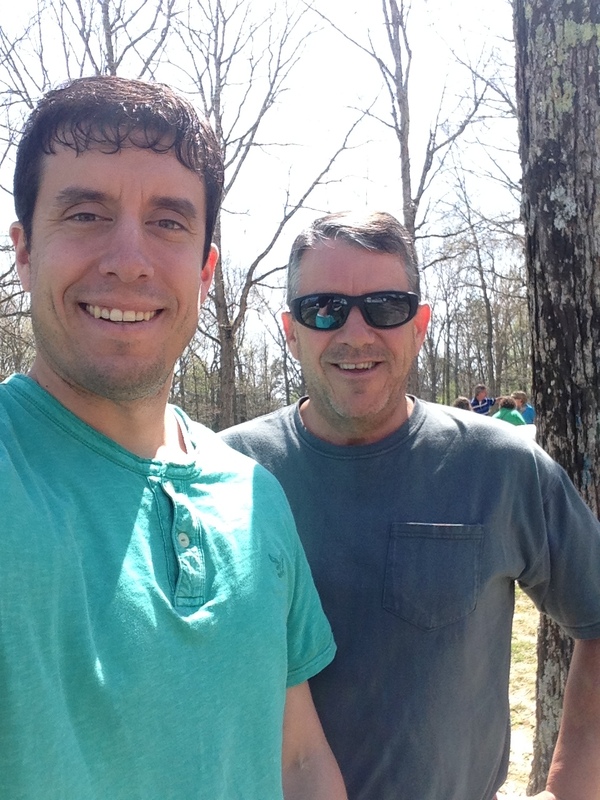 Rather, this year I get to wish him a Happy Father’s Day and then say “See you later this week!” It is true, by Thursday I will be in Spokane, together with my dad and family once again. I think this upcoming reunion definitely makes Father’s Day a little more special this year. 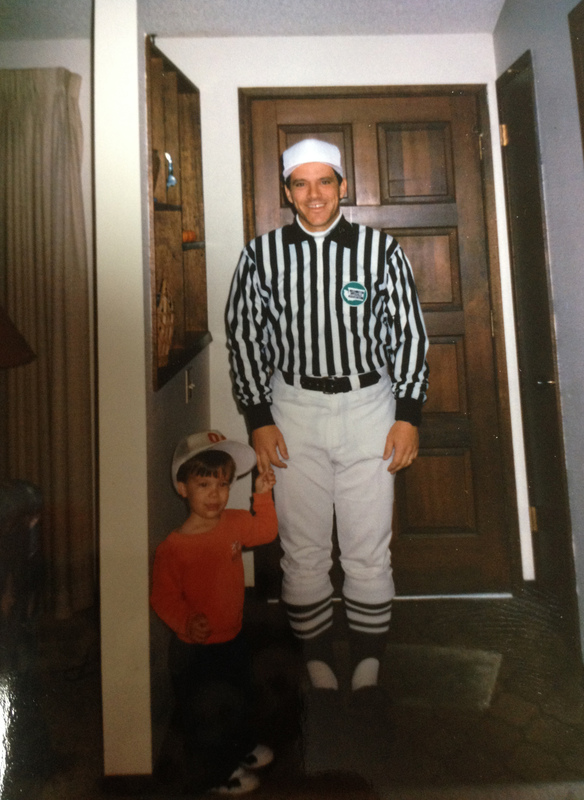 My dad and I when I was just a little boy. It seems like I hear people describe their dads all the time as strict, unemotional, down-to-business-type figures. This is definitely the exact opposite of my father. I grew up with a dad who was about as invested, loving, and interested in the lives of us Reser kids that a parent could possibly be. 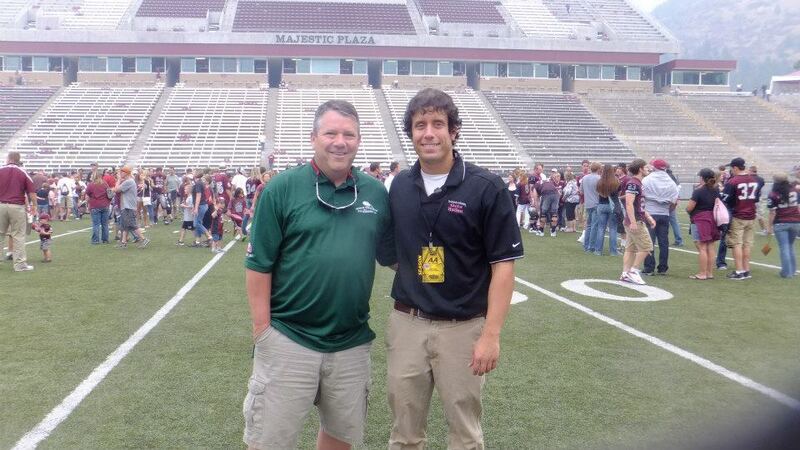 My dad and I on the field after a football game in Missoula a couple years ago. No matter what, both of us will forever fondly look back on the amazing cross country trip we took together in April of 2014. It wasn’t even a question, my dad was going to help me move from one part of the country to the other as I started the next phase of my career. Driving a U-Haul some 2,700 miles, we had a very special time spending every minute together as we passed through some of the most scenic parts of this nation. It was the absolute bonding experience, an experience that consisted of four days living in strange hotels in sleepy towns. It went perfectly. A photo from a rest stop during our epic voyage across the nation in May of 2014. On this Father’s Day I would like to tell my dad how much he is valued and appreciated by our whole family. Dads don’t come any better than Tom Reser and that just isn’t me blowing smoke. This upcoming week will be the start of a very memorable time and I can’t wait. See you soon, dad. Don’t Blink. 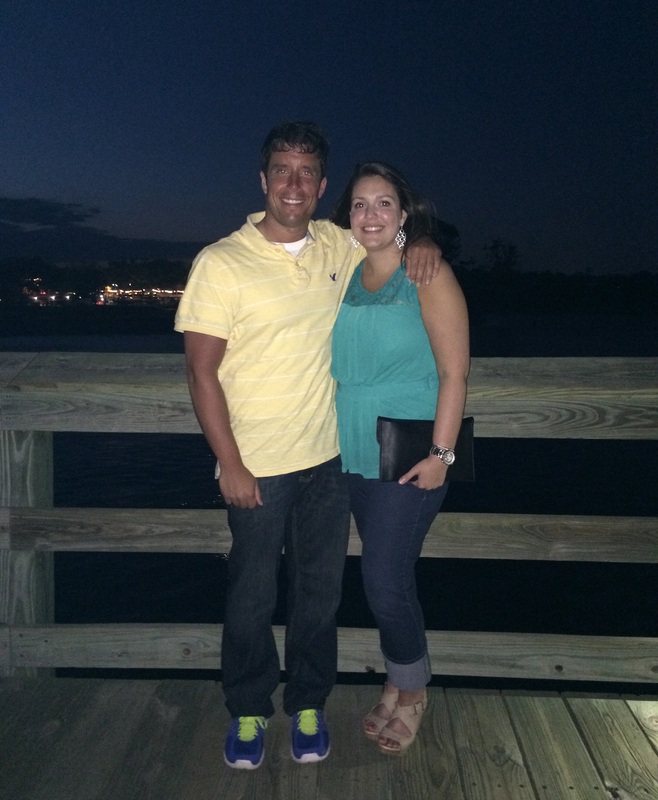 On Charleston – I really can’t say anything more than what has already been said. Even if I could think up something else to add it wouldn’t matter because words just can’t explain the evil. What I can say is that Charleston is an awesome city, a historical hot bed of our country that I have enjoyed the opportunity to visit a couple times since I have moved to the South. With the rest of the country, I pray for that poor church community and the city as a whole. 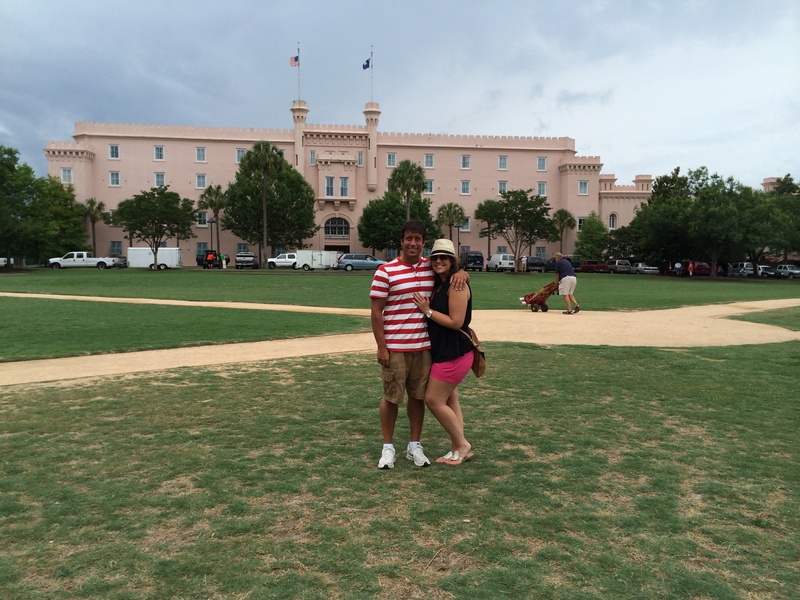 Sidney and I in front of The Citadel in Charleston last summer. Food I Need to Eat – Over the past couple of weeks I have come across some food items on social media that I need to try. Of course all of these are terribly unhealthy but I would love to sink my teeth into them. 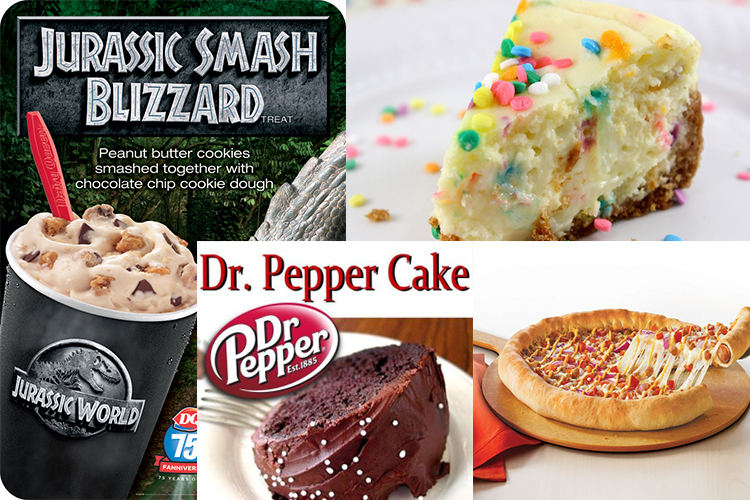 In no particular order, I need to try Dr. Pepper cake, cake batter cheesecake, Pizza Hut’s hot dog pizza, and the Jurassic Park Blizzard at Dairy Queen. I am going to try to make a deal with Sidney. If she will make me the first two items, I will pick us up the other two items. Although eating all of this would put the functioning of my heart in a very precarious position, it would make a great blog post. I need to try these food items! The Brew Mile – Have you heard of this yet? The Brew Mile is a challenge that encourages you to run a mile while pounding a beer every quarter of a mile. You attempt it on a track and each time you circle around you chug a can. This has become a big thing. I have thought long and hard about this and I have humbly concluded that I don’t think I could do it. I calculated that probably by the third beer I would be so bloated and side ache-stricken that I would have to walk. It gets me thinking though if anyone out there could complete a Brew 5K or maybe even a Brew Marathon. South Carolina Heat Wave – The past week we have experienced temperatures that reached well past 100 degrees on the heat index. The humidity that we “enjoy” in this part of the country has made breathing and staying outside for just a couple minutes a tough task. But you know what? I will take this weather over snow, wind, and cold every single day. When you have the beach and a beautiful pool at your disposal you can overcome the nastiest of warm conditions. The forecast in Myrtle Beach for the next five days. Temperatures in the mid-90’s mean conditions that feel well over 100 degrees. NBA Finals Wrap-Up – First off, congrats to the Golden State Warriors on a big championship victory. It was very well-deserved. Over the past couple weeks, I had been critical of Lebron James’ performance in the Finals. Because of this, a few of my friends routinely trolled me on Twitter. However, their attempts to change my thinking always fell short. Lebron put up CRAZY numbers during the series against Golden State. However, he simply wasn’t “at his best when his best was needed.” Every game during the NBA Finals he either blew it during crunch time of the fourth quarter or wasn’t a factor at all. Again, King James put up astronomical numbers but when it mattered most he fizzled. Twitter users tried to win me over to Lebron’s camp with outdated articles or blog posts that never addressed the main issue. James is an incredible player but he definitely was not the MVP of that series. Have a fantastic weekend! Once again, thoughts go out to Charleston. Don’t Blink. When summer rolls around and students leave campus, many professionals in higher education have the opportunity to become lackadaisical. The good ones don’t of course, including the social media marketers. While things definitely do slow down it doesn’t mean you stop trying to improve. Especially in the realm of social media where you spend all academic year trying to engage your audience, the last thing you would want to do in the summer is slack off and lose everyone. The months of June and July give me an opportunity to be especially creative while experimenting a little bit. In tonight’s blog post I will give three quick examples of what I have done this week to make sure we stay in front of our social media audience. Snapchat Alphabet Soup – Yesterday afternoon I placed a time sensitive challenge over our large and engaged Snapchat audience. I gave them a half hour to spell out “#CCU” anyway they pleased. They then of course had to Snap us a photo. In 30 minutes, I received about 30 images! Some people got really creative as one person used waffles, another used M&Ms, and another used s’mores ingredients! Others wrote the hashtag in cool calligraphy or wrote it on the beach. In the end I chose a winner (the s’mores entry won) and posted a really cool photo gallery on Facebook from the Snaps I had captured via screenshot. 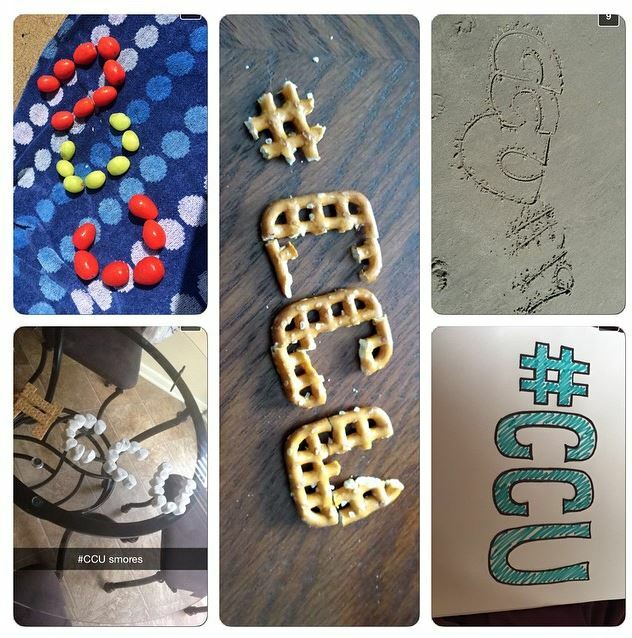 Here is a collage of some of the Snaps we received from our Snapchat audience spelling out #CCU. 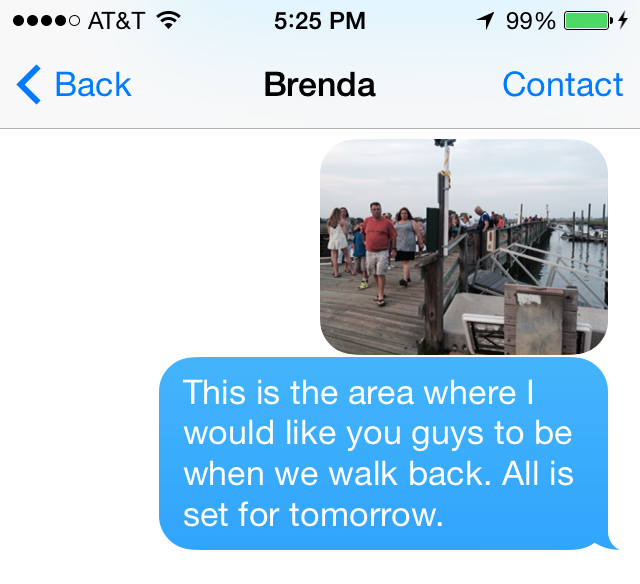 Value Your Alumni – During the summer, students have the tendency to stray away from social media because they are on vacation. However, that is not the case with alumni as most work year round so they stay consistent with their daily habits (which includes looking at social media). 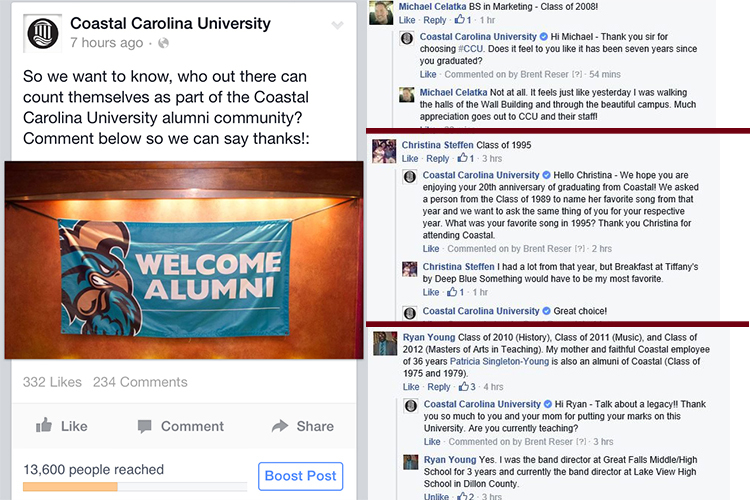 Today on Facebook I asked our alumni audience to comment underneath my post so that we could thank them for attending Coastal. With that motivator of a personal thank you from CCU, we had hundreds of alums leave comments. I spent today writing over 230 replies to Coastal grads. Don’t think I was just saying “thank you” either. I tried to work in a personal note for each person. It was time consuming, but fun, and best of all, our audience really appreciated it. On the left you can see the original post. On the right you can see three examples of the dialogue that I had with alums. Face-To-Face with the Future – During the summer, our university hosts nine different freshmen orientations. Last year I used guerilla marketing tactics to reach this very valuable group. On the second day of each orientation, there is an info fair that takes place. When this year rolled around, I wanted to take a more organized approach than what I did previously. I requested my own table for #CCUSocialMedia. This past Friday I was given a half table but by the second orientation on Tuesday I had my own space. During this one hour info fair I run social media promotions exclusively for the freshmen and bait them with sweet swag. I have had the opportunity to talk to many parents and students while literally watching our following on Twitter, Instagram, and Snapchat shoot right up. Myself with Chauncey on the left at my table. On the right you see students engaged. I don’t love summer just because it is hot outside and I get to eat a lot of ice cream. I also like it from a work aspect. Although it is more of a low key time, there is the potential to make some big gains. 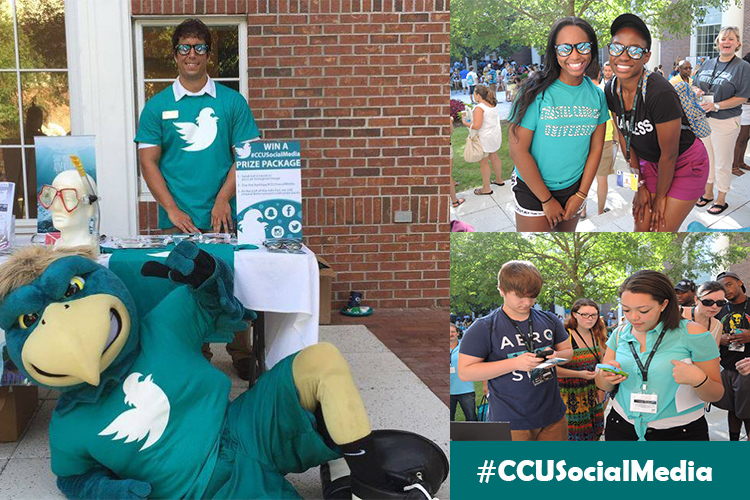 While some higher education social media marketers might use it as a time to rest, we at Coastal Carolina University are using it to get better. Don’t Blink. Every now and then a viral video will hit it big on Facebook and make the rounds on newsfeeds. I am not talking about a mega YouTube viral sensation, but a well-done video that touches people and generates some social media buzz. Recently I viewed a video that fits this criteria. Have you seen the “Ex-Lovers Meet After 30 Years” video? I have seen it shared on timelines by several of my friends, all girls. The situation itself is interesting. A man and a woman had a passionate relationship three decades ago. For whatever reason it came to an end. Then, many years later, the man surprises the woman. However, for me, a couple really weird quirks make the story much more entertaining (click here to watch the video). 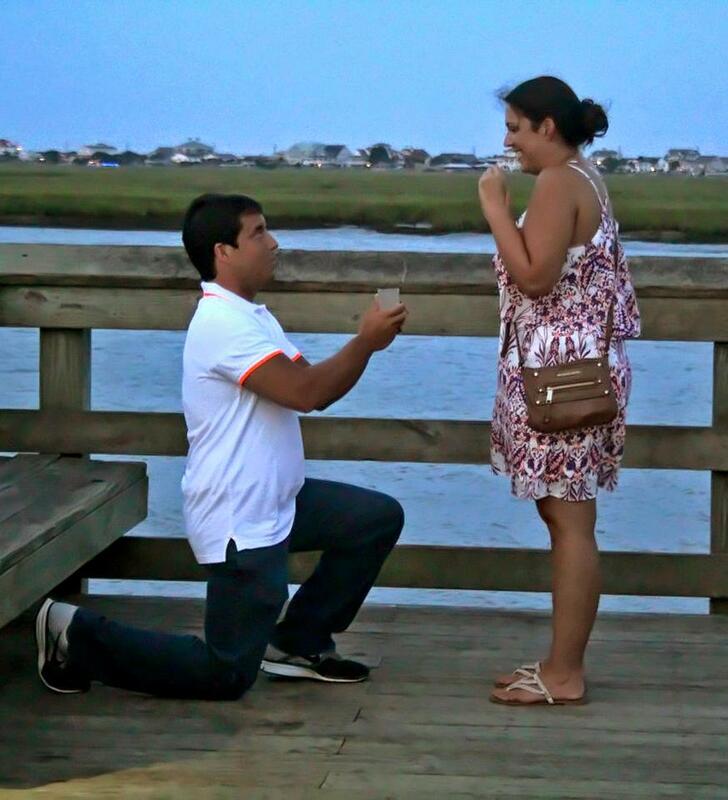 First off, this couple ended their relationship in a very strange way. When they decided to cease the romance, the man went to one end of the Great Wall of China and the woman went to the other end of the Great Wall of China. The two then walked toward the middle where they met each other for one last goodbye. WHOA. Who does that? I guess some people find it romantic, I just find it really funny. I immediately wanted to get a good look at these people. The second bizarre circumstance centers on the “art performance” the woman was engaged in when her former love surprised her. This lady had a show at the Museum of Modern Art where she would partake in an “artistic display” with museum patrons. What would actually happen, you ask? People would form a long line and wait forever just to have the opportunity to walk up to a chair, sit directly in front of her with just a coffee table as a barrier, and stare at her while she stared back. Seriously. That’s it. You pretty much play a blinking game with someone…and it is called art. Just like with the Great Wall of China act, this one didn’t really impact me in any way except for making me laugh. Now I really needed to see this video! What type of people would possibly do this?! Who would possibly do this? Well, this guy! No joke, this is an actual person who waited forever to stare at the woman. The production was typical of these type of viral videos. You had simple camera shots, a lot of facial expressions, and a powerful song. The set up was pretty much what I envisioned when I read the article prior to viewing the video. It was literally in some plain room with people standing all around watching the staring contest in the middle. The idea was just as outrageous in reality as what I had envisioned it in my brain. But not all of it meshed with my preconceived notions. In fact, I made a couple blunders in what I thought I would see. I believed the man and woman would be Asian. I was wrong about both of them. But race was hardly what surprised me the most. What really struck me was how disappointed I was. The former loves staring at each other. While many of my Facebook friends called the video “beautiful,” or went on about how much it made them cry, I never felt any of those ways. Instead, I was very much underwhelmed by the woman’s reaction. I was fully expecting that the second she saw her old flame her eyes would widen, she would gasp, and then she would fly out of the chair and jump into his arms. She never came close to doing any of those three things. Rather, she sat in her chair and looked back at him. She then extended her hands for an embrace. Sure you could see emotion and tears but I was expecting just a little bit more. An emotional woman after seeing her former love for the first time in over 30 years. Of course people will probably say that her simple reaction and the act of her putting her hands in her face when he left was more powerful than what I had expected. I can’t come to grips with that. Especially with these two very interesting people, I was hoping that a barrage of interesting things would occur when the man sat down. For me it just fell short. While the story and the backgrounds of the man and woman got me to watch it, having now seen it, I can’t recommend it. Instead I guess I will just write a blog post about it. Don’t Blink. Ah yes, the curious case of Rachel Dolezal. For those who don’t know (and I wish there were more of you) Dolezal was the President of the Spokane NAACP chapter. She recently came under fire because she was caught doing something dishonest. While the unraveling of her scheme played out, her biological parents came forward with some interesting news. The mom and dad said that Dolezal did not have one ounce of African blood in her. The former NAACP leader had claimed for a long time on official documents that she was part African-American. This whole ordeal has turned into a bizarre tale of twists and turns, one that we will undoubtedly see on Dateline a couple years from now. Catching the curiosity of so many is that Dolezal didn’t just identify as black on forms, she also tried to alter her appearance to look black and referred to herself as black on social media. 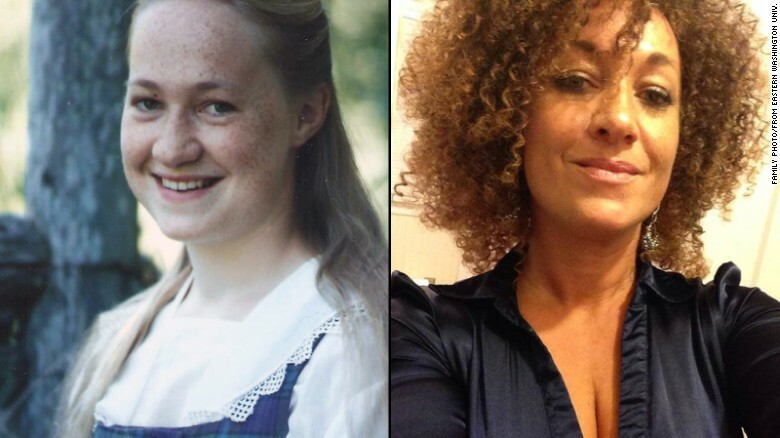 Rachel Dolezal as a girl and then what she looks like currently. We now live in a society where you can pretty much be anything you want to be when it comes to gender or race. Agree with it or not, it is where we are. Because of this, I won’t condemn Dolezal for trying to portray herself as black. However, I will call her out for what she did to draw attention to her in the first place. You see, the woman has made a career of staging fake hate crimes against her. She will send hate mail to herself, disguising it as anonymous vile that was directly sent to her because of her “African” heritage. This past time she attempted the scheme she got sloppy and investigators jumped in. 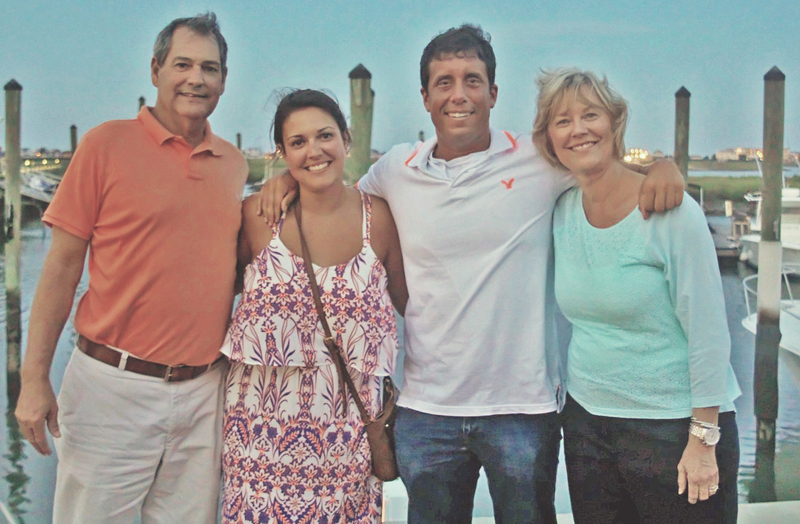 Her parents then emerged with her secret. The lies of Rachel Dolezal have impacted many. A large number of people probably have serious gripes against her. My only trivial complaint is that she is defacing the name of my hometown. If I walk inside a restaurant 3,000 miles away and they happen to be talking about Spokane, it better be about the Gonzaga basketball team or some kid doing well in a geography bee. I don’t want to eat lunch over some compulsive liar/attention-seeker who is making the Lilac City a laughing stock. When I return to Spokane in ten days, I wonder if I will bump into her at the airport. For some reason I don’t think she will be sticking around town for that much longer. Best of luck to her as she gets her life back together but I am really rooting for this story to run its course so Spokane can save face. Don’t Blink.